It could replace DSL and cable, or it could lose it all to 5G. Facebook’s plan to connect neighborhoods and businesses wirelessly, known as Terragraph, will begin field trials in 2019 using 60GHz technology from Qualcomm, the two companies said on Monday. Facebook began talking about Terragraph in 2016, part of a bid to replace fiber broadband with 60GHz millimeter-wave wireless. The technology wouldn’t replace Wi-Fi, but was designed to offer a replacement for fiber or cable to homes and businesses, forgoing the need to rip up streets and sidewalks. Now we have a date: 2019, the first time the technology will be tested, according to Jesse Burke, a staff marketing manager at Qualcomm. Actual deployment will come later, he said. 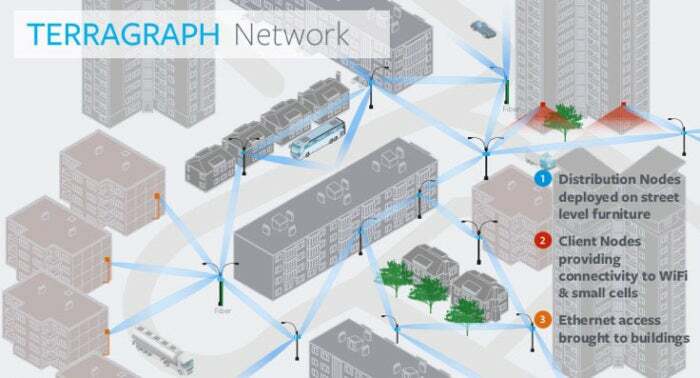 Terragraph would establish a mesh network of 60GHz wireless cells across a neighborhood. Terragraph is expected to begin field trials using a technology called 802.11ay, the successor to 802.11ad that debuted around 2016 or so. Though 802.11ay coud be used inside the home, it’s generally considered to be a wireless backhaul technology, providing the “last mile” connection directly to your home. According to Burke, the 60GHz 802.11ay technology would provide “two-digit” gigabit bandwidth to your doorstep. (Sources Network World talked to cited 20 to 30 Gbps as the most likely range.) You’d need some sort of a router or gateway that could receive the 802.11ay signal, the same way you need a gateway that a DSL or cable can plug into. The problem, if there is one, is that 802.11ay signals travel short distances, about 33 to 100 feet. That means that numerous “small cells” would need to be installed around the neighborhood, most likely within a mesh network where each small cell can talk to one another, Burke said. They also require line of sight. Under the theoretical models that the two companies have constructed, Burke explained, those cells would be mounted on light poles, or on the roofs or sides of buildings. While Qualcomm’s Burke couldn't speak to Facebook’s specific plans, he said the trials would target a municipal city block or multiple city blocks at scale. In February, Facebook said that two field trials were planned: in Budapest, Hungary, and in Kuala Lumpur, Malaysia. A Facebook spokesman declined to comment further. Metropolitan wireless had its heyday, then quietly went away—probably because of a combination of slow speeds, high cost, and the recognition that smartphones simply made it irrelevant. In 2005, for example, Google’s plans to build out 300 Kbps Wi-Fi in San Francisco were met with great excitement. Today that Wi-Fi network exists just along Market Street, and in many of the city’s parks. What this means to you: Replacing existing wired infrastructure with a massive wireless push has been tried before. You might recall Intel’s grand WiMAX plans that scored a deployment or two in the United Kingdom before petering out. While there are occasional wireless deployments (such as Webpass in the Bay Area), generally cable and DSL hold sway. And, of course, there’s one major exception: good old-fashioned 4G, which has been held back not as much by throughput but by bandwidth caps. It’s very possible that Terragraph, whatever it looks like, will be rendered irrelevant by 5G technology.